Netflix is one of several big-name stocks likely to see volatile trading over the next few days. 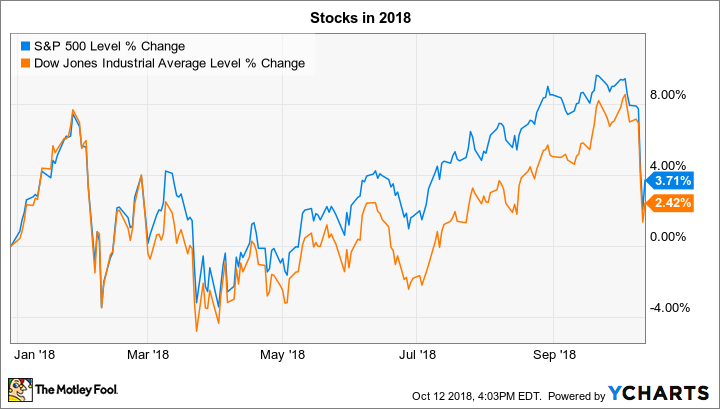 Volatility struck the stock market last week as both the S&P 500 (SNPINDEX:^GSPC) and the Dow Jones Industrial Average (DJINDICES:^DJI) posted sharp declines of over 4%. The slump cut year-to-date returns in half, but indexes are still in positive territory so far on the year. Looking ahead, third-quarter earnings season is kicking into high gear, and there a hundreds of companies set to update investors on their businesses this week alone. Below, we'll take a closer look at the highly anticipated announcements that could send shares of Netflix (NASDAQ:NFLX), Domino's (NYSE:DPZ), and Procter & Gamble (NYSE:PG) moving in the trading week ahead. Netflix, one of the market's most successful stocks over the past decade, will announce its earnings results after the market closes on Tuesday. Stakes are high for the streaming video giant, which missed subscriber growth estimates by a wide margin last quarter. "We had a strong but not stellar Q2," CEO Reed Hastings said in July after the company added 5.2 million new members to match the prior-year period, but came in below executives' forecast of 6.2 million. Management's third-quarter prediction calls for 5 million new streamers to have signed up in the period, which would mark a slowdown from the prior year's 5.3 million boost. Beyond that, investors are expecting to see significant revenue and profitability gains as Netflix benefits from higher plan prices and maturing international markets. Its cash flow, on the other hand, should remain sharply negative due to the company's focus on building on its popular, but expensive, portfolio of exclusive and original content. Domino's posts its results on Tuesday morning, and investors have high hopes for the delivery giant's latest operating trends. Its last quarterly report hit all the right notes, with sales expanding by a robust 7% at its existing take-out and delivery hubs. That boost, plus the addition of 156 new stores to its global base, allowed revenue to jump 24%. CEO Rich Allison, who just took over the top spot at the company, says Domino's has plenty of room for growth ahead. And as support for that prediction, Alison pointed to strong customer traffic trends in the core U.S. market and healthy profit margins overall. Investors will be watching for more evidence of market share gains in the U.S. and a faster growth rate in the international segment this week. Those wins should help Domino's easily fund the aggressive spending plans executives have that include adding two major new supply centers. Shareholders have come to expect only modest sales gains from Procter & Gamble lately as the consumer products titan struggles with small but persistent market-share losses. P&G's portfolio reboot, after all, helped lift profitability, but so far, it has failed to accelerate growth much beyond the 1% to 2% range. On Friday, the owner of hit global franchises such as Pampers and Gillette will kick off its fiscal 2019 year with results that should show continued struggles on the top line. There are reasons for cautious optimism, though. P&G predicted in July that sales growth would speed up to between 2% and 3% this year, following two consecutive years of underperformance. Investors will see results from the first big test of that forecast on Friday, when P&G reveals how well volume trends held up after the company raised prices across key sections of its portfolio. If P&G can't pass along higher commodity costs, on the other hand, then profit margin struggles would join the company's list of stubborn operating challenges in this slow-growth environment.